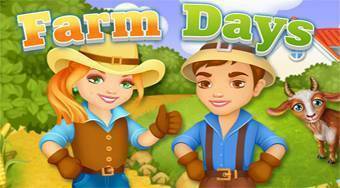 Do you like Farm Days? Share it with your friends. Care for the farm you've inherited, and help it flourish with the help of your loyal friends. You can plant the most succulent crops and fruit trees, care for them, and bring in abundant harvests. Become the owner of wonderful farm animals that provide you with fantastic products, like milk, wool, meat, and eggs. Perfect your cooking skill by improving your abilities at the stove, the oven, and the other kitchen tools. Sew the most beautiful clothes at the loom, find rare materials in the mines, and create magical souvenirs at your workbench. Deliver homemade farm products, earn rewards, and become the best salesperson far and wide! Go fishing with your friends - a good catch is guaranteed! Play with your farm colleagues, and get more companions - the more neighbors you have, the more fun it will be. Enter farm alliances, exchange with other members, and help each other! Take part in weekly events, enjoy the competition, and receive great rewards! Plant, harvest, feed, cultivate, build, and visit! Everything's more fun together!